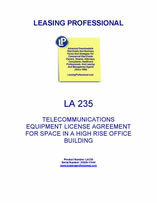 This License Agreement permits a telecommunications vendor or equipment provider to locate equipment in an office building. The agreement is characterized as a license agreement to avoid the possessory rights that accrue to the tenant under a lease agreement. The licensee (the telecommunications company) receives the right to locate its equipment in a suite in the office building, and the licensor (landlord) gets paid for allowing the licensee to do so. The equipment company (i.e., the licensee) has substantially unlimited access to the space for servicing and managing the equipment, and retains ownership of the communications or information technology equipment.